Women are half the world's population - a wise man once said "women hold up half the sky." At the current rate, it will take 35 years for women to hold up half the corporate sky! And when we look at the data on women in leadership positions in European or S&P500 companies, for example, we have a bittersweet picture: Only 15.6% of executives and 5.6% of CEOs of large European companies are women. Yes, these two figures have increased over the last four years... but by only one percentage point per year. Not much different from the S&P500 figures, where women make up 16.5% of executives and 5% of CEOs. At this rate, we will reach a 50/50 gender balance in 2052. 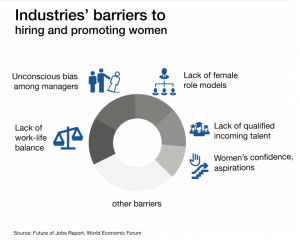 Does it make sense for women to only support 16% of the corporate sky? Seriously? No, it doesn’t. Many studies correlate the relationship between better economic performance of companies with more gender balanced leadership teams. Likewise, it is widely demonstrated that diverse teams are a platform for value creation in companies - whether by driving growth, reducing costs, increasing productivity of assets - diverse teams are more efficient. So the question is: What do we expect? The time has come to accelerate. An annual percentage point is not enough. But how do we enable this acceleration? The World Economic Forum provides a few guidelines in its report "the future of jobs report”. So what is Nokia doing about it? In 2016, Nokia Gender Balance Steering committee headed by Barry French, Nokia Chief Marketing Officer kicked off an holistic 5 year action plan encompassing leaders’ engagement, leveling the playfield in leadership development for talented women, awareness building, inspiring the next generation. Develop more talented women into leadership. From 2016, we launched 2 high-touch career development programs involving 50 talented women per year. Foster a gender-neutral culture through training for leaders and managers, and ensure that all our processes and communications are gender neutral and inclusive. Build a long-term talent pipeline by helping to bring more girls into Science, Technology, Engineering, and Mathematics (STEM). In 2017, we launched a global collaboration with greenlight for girls (g4g) to help inspire teenagers about science at Nokia locations in Espoo, Finland, and in Paris Saclay, France. Nokia employees are also acting on gender balance through StrongHer, a worldwide employee network that promotes gender diversity, with 2300+ members in 60+ countries on 5 continents, including 23% male membership. Through 2016, the gender balance at Nokia has improved by 2 percentage points, up to 22% in the workforce and 14% among senior managers. This represents progress towards Nokia’s ambition, shared by our CEO Rajeev Suri in 2016, to have a gender balance that reflects the world around us and a workplace where both men and women have equal opportunities to succeed in every function and at every level. We’re moving in the right direction…let’s do what we can to pick up the pace. Read more in our People and Planet report and our Global Career Pages. Pascale is head of Global Diversity & Inclusion at Nokia, bringing 25 years of experience in innovation, strategy and diversity.Pascale co-founded StrongHer, the employee network that promotes gender diversity, with 5 other colleagues at the beginning of 2011. Today, StrongHer has 2300+ members in 60+ countries on 5 continents, including 23% male membership.